The Drucker Institute has announced that HopeLab is the winner of the 2014 Peter F. Drucker Award for Nonprofit Innovation. Like Peter Drucker, we see changes in technology and society as opportunities, not threats. The judges recognized HopeLab for its pioneering work in creating products that help people tap into their innate resilience and respond to life’s adversity in healthy ways. The organization will be honored with a $100,000 prize, an amount made possible in large part through the generosity of The Coca-Cola Foundation. “HopeLab’s Resilience Initiative is a powerful example of Peter Drucker’s insight that true technological innovation often ‘demands not one kind of knowledge but many,’” said Rick Wartzman, the Drucker Institute’s executive director. “HopeLab combines promising technology, research into psychology and biology, and design principles based on direct engagement with its target audience—itself a very Drucker-like practice. In all, the Drucker Institute received 687 applications for the Drucker Award this year from nonprofits in 46 states and the District of Columbia. The final judges for the Drucker Award were Wartzman; Tim Brown, the president and CEO of IDEO; Sumita Dutta, managing director at Golden Seeds; Geneva Johnson, retired president and CEO of Family Service America and Families International; Mario Morino, co-founder and chairman of Venture Philanthropy Partners and chairman of the Morino Institute; Sally Osberg, the president and CEO of the Skoll Foundation; Susan Phillips, vice president of human capital at the Omidyar Network; C. William Pollard, chairman emeritus of ServiceMaster Co. and a member of the Drucker Institute’s Board of Advisors; and Kathy Waller, chief financial officer and executive vice president of The Coca-Cola Co. The judges noted that they were particularly impressed with the way that HopeLab met a key criteria for the award—showing how its programming makes a real difference in the lives of the people it serves. For example, its Re-Mission video games for adolescents and young adults with cancer address the problem of poor treatment adherence by putting players inside the body to battle the disease with weapons like chemotherapy, antibiotics and the body’s natural defenses. Working with hospitals and clinics, HopeLab has distributed more than 210,000 copies of the game in 81 countries. And research published in the medical journal Pediatrics found that playing Re-Mission significantly improved key behavioral and psychological factors associated with successful cancer treatment. 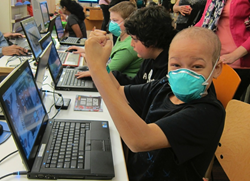 In fact, in the largest randomized controlled study of a video-game intervention ever conducted, participants who were given Re-Mission took their chemotherapy and antibiotics more consistently, showed faster acquisition of cancer-related knowledge and increased their self-efficacy. Building on the success of this founding project, HopeLab has since launched the Re-Mission 2 online games and mobile app, the Zamzee program to boost physical activity and combat sedentary behavior in children, and a number of other mobile apps and social technologies that support resilience and improve health. The Drucker Award has been given annually since 1991 to recognize existing programs that meet Peter Drucker’s definition of innovation—“change that creates a new dimension of performance.” The cash prize is designed to celebrate, inspire and further the work of innovative social-sector organizations based in the United States. Thanks to funding from The Coca-Cola Foundation, the first-place award will remain at $100,000 through at least 2015. Wartzman pointed out that the Drucker Award application has itself become a way to teach nonprofits about Peter Drucker’s key principles of innovation. A survey of those completing this year’s application found that 97% said they now had a better understanding of how their program was innovative, and, most significantly, 87% said the application had prompted them to explore additional opportunities for innovation in their work. The Coca-Cola Foundation is the global philanthropic arm of The Coca-Cola Company. Founded in 1984, The Foundation has invested more than $660 million to support sustainable community initiatives focused on replenishing water, empowering women and enhancing the overall well-being of people and communities. For more information about The Coca-Cola Foundation, please go to http://www.coca-colacompany.com/our-company/the-coca-cola-foundation.